What happens when your age, ethnicity, lifestyle and family medical history show no signs of cancer risk, yet you end up being diagnosed with breast cancer? This was the case with an Asian women named Wendy Holt. 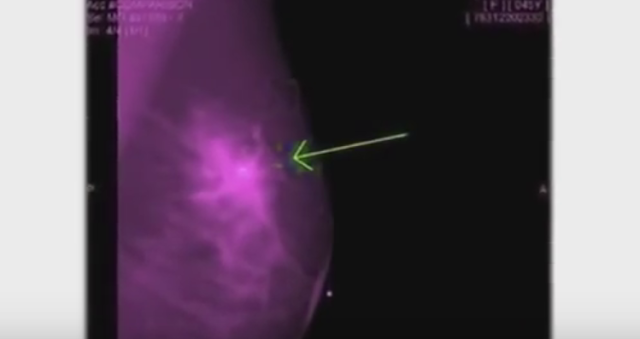 She was diagnosed with having a very unusual formation of small tumors in her breast region. Wendy suddenly had a feeling of what was the cause of this. But could it seriously be true? Inside her bra, Wendy had stored her cell phone and she had performed this habit for years. Ten years to be relatively exact. Her first cell phone was in 1999, and she quickly realized since her chest size was large she could easily stash her phone there without much fanfare. She continued this routine for ten years and estimates that 70 percent of her day was spent with her cell phone inside of her bra, pressed against her chest. But in this video a doctor as well as others knowledgeable about Wendy’s case all agree with the cell phone theory, as there seems no other explanation for the very odd array of tumors, which just so happen to match where the cell phone was placed on her chest. Check out this important video below so you can be aware of the extreme dangers of having a cell phone on your body, touching your skin. The best thing to do is carry it in a purse or bag, or at least in a pocket where direct skin contact is avoided. It’s extremely sad to hear that this woman had to pay with her life for something that one wouldn’t think to be that big of a deal, and certainly not life threatening. Wendy will take her final vacation with her family to Malta. Please SHARE her important story with your friends and family as to avoid having anyone else suffer such horrible consequences.